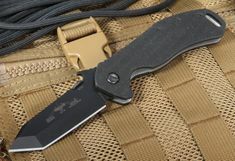 The American-made, Emerson Bulldog tactical knife is crafted with a modified handle shape of the Emerson Commander with Emerson's signature tanto-style blade, giving you the combined strength and durability of two of Emerson's popular designs. Made with 154CM stainless steel, the Bulldog is made to withstand rugged use and rust, time after time. With a one-sided chisel grind, the blade is stronger and can cut through materials easily, while retaining a sharper edge for longer. Bulldog's blade length measures at 3.2 inches, has a blade thickness of .125 inches, and a Rockwell Hardness of 57-59. You have the option of keeping the blade's edge plain or serrated. It comes in only a stone washed finish, great for concealing scratches from use, and reducing the glare that can come off the blade. The blade also locks up in an aerospace-grade titanium liner lock system, providing great security and strength. The 4.3-inch long handle is constructed with G-10 epoxy/glass laminate, contoured with award-winning grip and ergonomics. 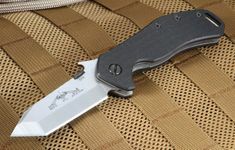 It features Emerson's patented wave feature, which allows for quick withdrawal from your pocket, in addition to the ambidextrous thumb disk for quick deployment of the blade as well. The handle also features a tip-up carry clip and a lanyard hole for carrying. Overall, the handle provides a strong, comfortable grip, even in wet or slippery environments.